When should I use the fancy “convection” setting on my oven instead of “bake”? I purchased a house almost two years ago that has a convection oven. I have never used the convection oven because I have no idea how to and, to be honest, I am a bit afraid of it. My question is: When should I use it, and can any recipe be converted to a convection recipe? OK, OK, I can take a hint. In the short time I've been writing this column, I've gotten twice as many questions about convection ovens as I have about any other topic. And like a politician in an election year, I am easily swayed by public opinion. Plus I don't like the idea of Shannon being afraid of her oven. As a huge kitchen-gadget nerd, I'm sort of embarrassed that I never figured this one out for myself. It turns out that, unlike bacon or beer (or both? ), convection cooking is not a panacea. You might save yourself some cooking time and use a little less energy, but it takes some experimentation to convert conventional recipes to convection. Cooking is putting heat into food, and there are three main ways to do that: conduction, convection, and radiation. Conduction transfers heat from a hot object (such as a skillet) directly into the food that it's touching. Convection transfers heat via a moving fluid (liquid or gas). And radiation transfers energy from a hot object via electromagnetic waves; think of warming your hands by holding them near a fire. All three methods contribute to cooking in a standard oven: conduction from the pan, incidental convection from random currents of hot air, and radiation from the oven walls. Convection can be very efficient — think of how “efficiently” a cold wind carries away heat from your skin — so convection ovens use forced air (fans and ducts) to maximize the effect. 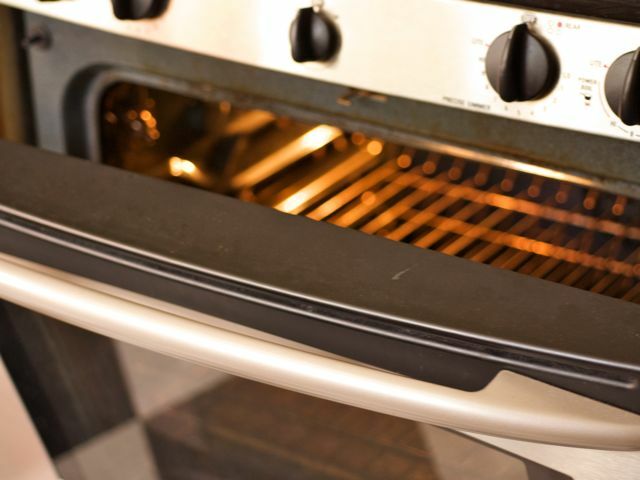 Standard ovens have a heating element in the bottom of the oven and radiating surfaces on the top and sides. The heat is most intense from the bottom and can lead to burning or excessive browning of the underside of foods before the top and center are cooked. Convection ovens typically take the heating element out of the cooking chamber and use a fan to blow heated air over the surface of the food. Commercial convection ovens are specially designed — often with multiple fans and variable speeds — to cook uniformly and efficiently by convection. The home convection-mode ovens we're talking about are usually standard ovens with an optional convection fan/heater unit bolted onto the back wall, slightly reducing oven space. Because convection heat transfer is more efficient, manufacturers recommend lowering the cooking temperature by 25 degrees to avoid overcooking the exterior of the food. Similarly, you should decrease the cooking time by 10 to 25 percent (instructions vary depending on the oven model). Because fans use less energy than heating elements, this could save you a little on your energy/carbon-guilt costs. bq. \[Recipes\] may require adjustment and testing when converting from standard to convection modes. If unsure how to convert a recipe, begin by preparing the recipe in standard Bake mode. After achieving acceptable results this way, follow the convection guidelines listed \[(minus 25 degrees and 10 percent cooking time)\]. If the food is not prepared to your satisfaction during this first convection trial, adjust only one recipe variable at a time (such as cooking time, rack position, or temperature) and repeat the convection test. If necessary, continue adjusting one recipe variable at a time until satisfactory results are achieved. And just $700 and 14 Beef Wellingtons later, you've got a satisfactory result! Obviously this is a welcome challenge if you're a budding Christopher Kimball, but it's not good news when you're trying to bang out two dozen brownies for tomorrow's school bake sale (and don't forget about nut allergies!). Even after all of your diligent experimentation, you (aka “the user” — the Dacor corporation maintains a careful emotional distance) may find that some foods are still prepared “more successfully” in standard Bake mode (the manual's example is “custard"). Of course, no recipe is perfect on time and temperature, which is why we have meat thermometers, toothpicks for cake testing, etc. There's always a certain amount of cook's judgment involved. Only you can decide whether you want the additional challenge of convection-cooking trial and error. Will the few minutes or kilowatt hours you save be worth it? I decided that the convection setting would be worth a try for sturdy, crusty foods that don't require accurate timing in the first place — things like breads, pizzas, and roasts. I conducted a small experiment with my electric oven, which has three modes — Bake, Convection Bake (CB), and Pure Convection (PC) — and tops out at 555 degrees. According to the manual, Bake mode uses the heating element at the bottom of the oven, CB uses the bottom element plus the rear convection fan, and PC forgoes the bottom element for a hidden annular element surrounding the fan. For my experiment, I selected a food that loves intense heat: pizza. 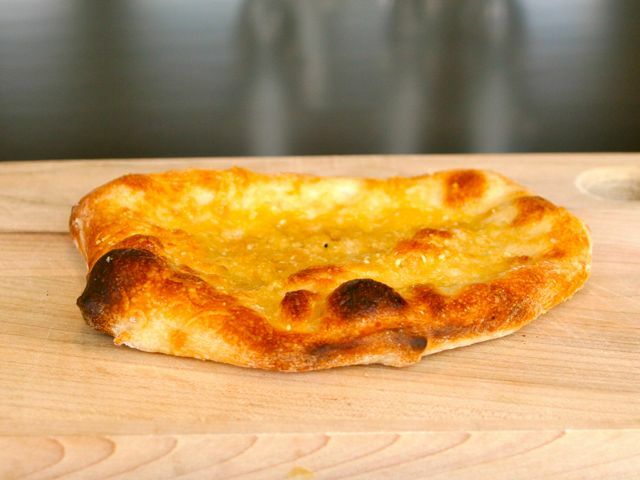 A scorching-hot oven provides a quick rise, nicely charred crust, and chewy texture in the typical Neapolitan pie. Pizza nerd Jeff Varasano is famous for, um, “modifying” his home oven to cook two-minute pizzas in the 850-degree self-cleaning mode. (He just opened his own pizzeria in Atlanta.) I haven't been able to talk my wife into  jailbreaking our oven, but could I use convection to make it perform like a slightly hotter one? The last time I made pizza dough (using the recipe from Artisan Baking), I made a little extra. Thus I had three tiny, 55-gram dough balls stashed in the fridge, one for each of the three baking modes of my oven. I preheated the oven to 555 degrees in Bake mode with a baking stone on the lowest rack, and pulled out the first dough ball to bring it to room temperature. 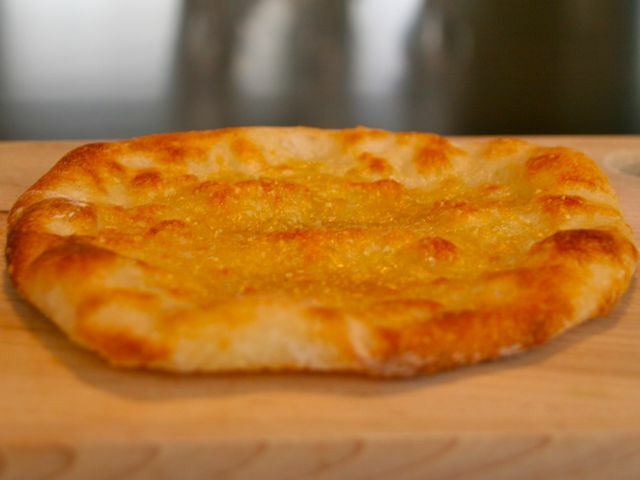 I gave the dough and the oven 30 minutes to stabilize, then shaped the dough into a small pizza which I topped with a teaspoon of olive oil and a tablespoon of grated hard cheese. Then I baked the pizza for exactly five minutes, photographed it, and “conducted a sensory evaluation” (i.e., I ate it). Lather, rinse, and repeat twice for the CB and PC modes (with 30-minute stabilizing periods between each test). In my oven, the convection modes cooked noticeably faster and hotter. The Bake-mode pie was uniformly golden brown, while the CB and PC pies clearly show the telltale charred signature of intense heat (see autopsy photos). The CB pie was the most cooked (perhaps due to the proximity of the bottom heating element) and slightly dry. It probably should've been pulled at four minutes and might have won the taste test. But in this strict five-minute bake-off the PC pizza was the best: a crisp outer layer covering a chewy and yeasty interior. Ovens are supposed to cook more evenly in convection mode, but mine didn't. According to the manual, I can load three racks with cookies or muffins and expect them to bake evenly, without the usual dance of opening the oven and shuffling sheet pans every few minutes. Unfortunately, my experiment suggests otherwise. 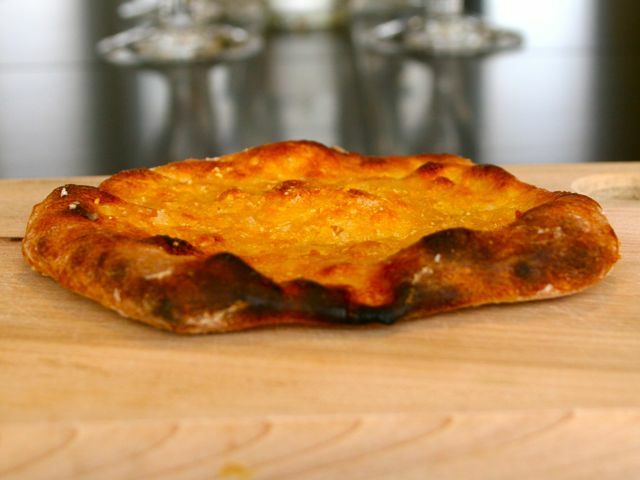 The standard Bake mode actually produced the most even browning in this experiment, while both convection modes cooked part of the pizza significantly faster. Professional convection ovens get closer to the “set it and forget it” ideal, but even bread expert Peter Reinhart says that he's “yet to find \[a convection oven\] without hot spots.”  So the “musical pans” dance is here to stay. Limitations aside, I'm at least a partial convert to convection-mode cooking, and I'm kicking myself for cooking so many pizzas and breads in boring old Bake mode. But I don't think I'll be trying it with anything touchy like soufflés, as saving a few minutes doesn't seem worth the risk. Up next: roasted meat trials. If anyone has data to share, please do so in the Comments below.